He shouldn’t be parked there but then again where else are businesses supposed to unload? It’s not like its some fat king of the road range rover driver type popping in for a coffee and danish, If the blinkers are on , a few minutes isn’t going to kill any cyclist who is paying attention. Just cycle around the van. No drama. Now, if a car behind a cyclist start beeping because the cyclist is out of his “box” going around the van even though the cyclist had right of way, then certainly, go nuts at the driver of the car. I’ve been cyclist these ‘mean streets’ for decades, the only thing more annoying than cars , vans, and fat loser Rangerover drivers hogging a cycle lane , is the four eyed, reflector , side mirror on the handlebar (seriously?) go pro on helmet dorky sensitive type cyclists stopping to shake there fist and causing more disruption to normal cyclists who are just trying to get from A to B. Just cycle around. Extra time added to journey = about 0.5 seconds. 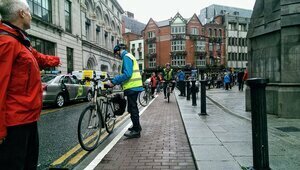 Your “couple of minutes” reference makes no sense in the context of road transportation a cyclist only passes any given spot for a couple of seconds. 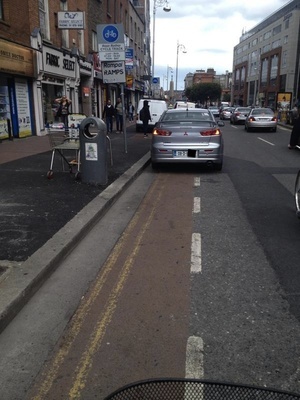 Parking in the cycle lane creates extra risks for cyclists. If you are only taking 0.5 seconds to get around this van then you are putting yourself in very serious risk of being hit by a passing car. As to where they should unload. 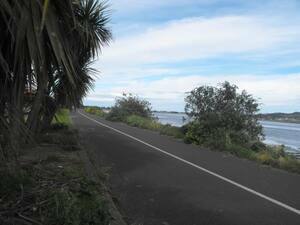 He could park around the corner where there is no cycle lane and walk a few metre. 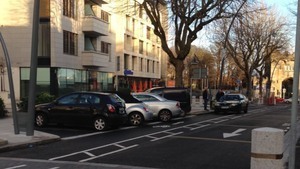 There are also two lanes for cars to use so he could stay out of the cycle lane and stop in the left lane. The “couple of minutes” rule surely applies here as the cars can just go around? Good point, there are two “car” lanes so surely it wouldn’t be a problem for motorists for the the van to park in one of them for “just a few minutes”? Hazard lights on make anything legal. 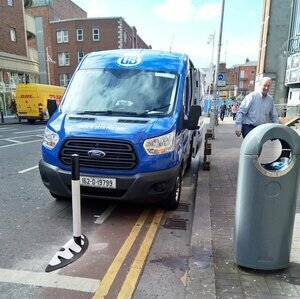 Possibly a lot more contra-flow cycle lanes in Cork compared to Dublin, but people parking on those is even more of a hazard. You’re cycling along, there’s a van in your lane, you have to swerve out onto the road against oncoming traffic to get around, or give up and get up on the footpath. If the van left enough room to pass on the inside it would be something. Gully agree with postmanpat here. Cyclists should pick their battles better. Delivery driver just trying to do his job. Lighten up ffs! There’s a loading bay 50m away, and another 100m away. I get the impression that some cyclists (including the photographer) are under the impression that they shouldn’t have their journey impaired whatsoever, as you said it is a minor delay for any cyclist that is using the roads with care and consideration, that means slowing down, removing the ear phones, looking around and indicating to the other road users their intentions just like every other road user has to. Cyclists you may need to be treated like children but please you are not the center of the universe, you are just another person, a very vulnerable one so behave like you are not bulletproof. I just wonder will a bicycle ever create one job? Bicycle shops are businesses and employ people, speaking of stupidity at volume. Don’t be silly Nigel. Bicycles spring up overnight like mushrooms. There are no jobs involved in designing, manufacturing, supplying, selling or maintaining bicycles. ..also, no blurred reg? what way does this work at all? There is no requirement to blur a van registration least of all on a vehicle owned by a business. driving OVER the divide, is indefensible. That’s brute ignorance. That’s the actions of someone who gets out of the car to scream in windows of pregnant ladies who didn’t let them in their lane. For tootly-pumpkins sake, it is permitted to drop passengers, or to unload on a double yellow line (note the side door of van is open) also it is permitted to drive on and even park on (for 30 mins) advisory cycle lanes. Not correct, there is no parking permitted on Double yellows lines at any time whether unloading or not. 36. (1) Save as otherwise provided for in these Regulations and subject to article 5, a vehicle shall not be parked on a public road at a location, in a manner or for a purpose referred to in this article. 5. (2) ( e ) a prohibition on the parking of a vehicle imposed by article 36(2)(a) shall not apply to a vehicle parked while goods are being loaded in or on to it or unloaded from it, for a period not exceeding thirty minutes from the commencement of the parking. That is an absolute joke, you can block a fire station or ambulance bay for 30mins if you’re unloading. Needs to be changed. You seem pretty clueless, perhaps you could get a job with the RSA. Get your case of beer for that. Why is there a pole in the middle of the left hand driving lane? Remember that the cycle lane is ‘advisory’ so the left edge of the driving lane is the kerb rather than the dotted line. Double yellow line isn’t ‘advisory’. Seriously, stop digging, the more you post about road traffic rules, the worse it’s getting. In Merrie England there do be double red lines here and there, like central London for example. They mean no stopping at all, at all.